The Rousseau family has been putting food on the tables of Arizona families since 1892 and over 120 years later are still committed to providing Arizonans with fresh, healthy and locally grown produce. Will Rousseau, the owner of Rousseau Farming Company®, is a fourth generation Salt River Valley farmer. His maternal great grandfather, Charles Pendergast, came to Phoenix in 1878 working on a grain harvesting crew. He put down roots here and ended up owning several thousand acres today. L. D. Rousseau, Will’s paternal great grandfather, came to Phoenix in a covered wagon in 1892. He and his wife eventually bought land in west Phoenix and made a life for themselves and their family. <pWill’s father, Bill Rousseau, was primarily involved in the cattle business with a feed lot in West Phoenix that he operated until 1980. Will graduated from the University of Arizona in 1979 with a Bachelor of Science in Agronomy. He worked with Bill for two years before starting his own operation. 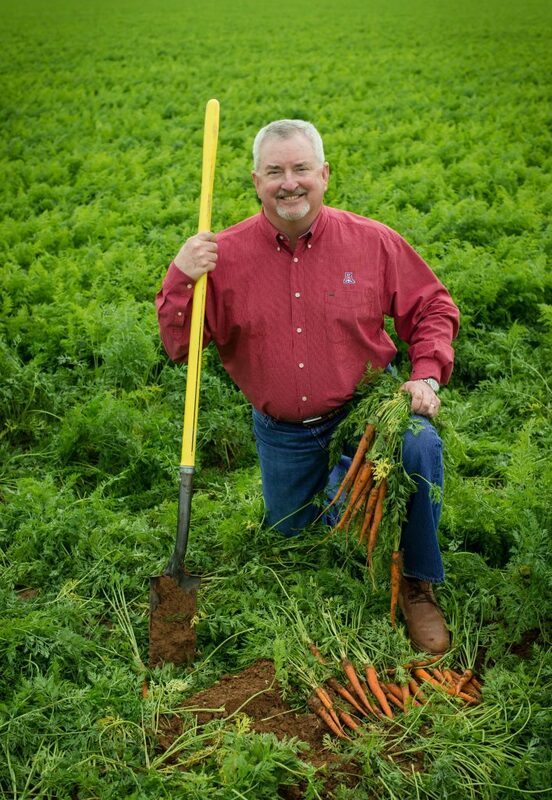 By 1986, Will was farming 1,700 acres of row crops before experimenting with 40 acres of carrots. Today Rousseau Farming Company® consists of 9,000 acres, of which over 70% are vegetable production with the core crops being carrots, broccoli, cabbage, mixed greens, celery, onions, sweet corn and watermelons. Over 1,100 acres are dedicated to organic farming methods. The operation is vertically integrated with its own harvesting equipment, trucking, cooling, icing and shipping facilities. The facilities are state of the art and include a carrot packing plant that packs baby peeled carrots as well as cello packed whole carrots. The majority of the produce is distributed to local grocery chains, restaurants and supermarkets such as WalMart and Costco in Arizona and other states.